Just say no to boiling or steaming! Whether it’s a mushroom, a potato, a zucchini, or an eggplant, that veggie belongs on the grill—and in Grilling with Veggies, Steven Raichlen teaches you how to grill it perfectly every time. Includes grilling times and techniques for common (and not-so-common) vegetables as well as twenty-five recipes for unique grilled-vegetable sides hailing from all over the world. Catalan Grilled Artichokes from Spain join Sesame-Grilled Oyster Mushrooms from Korea for a mixed grill that’s full of showstoppers. 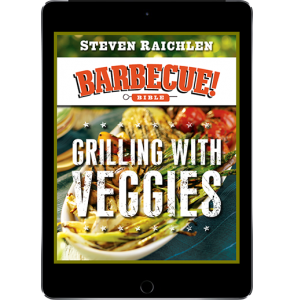 Note: Grilling with Veggies is an excerpt from Steven Raichlen’s award-winning The Barbecue! Bible®.